Centennial, CO, May 25, 2010 – Internet Pawn, Inc., the first dedicated online pawn shop in the United States, today announced that it has an Armed Courier Service shipping option for its best customers through Brinks Global Services. Centennial, CO Internet Pawn, Inc., the first dedicated online pawn shop in the United States, today announced that it has an Armed Courier Service shipping option for its best customers through Brinks Global Services. 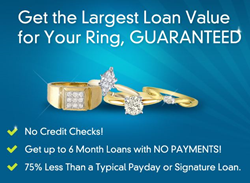 Internet Pawn added the Armed Courier Service to meet the demands of discerning diamond jewelry and luxury watch owners seeking short term loans from the Denver-based enterprise. Internet Pawn now offers customers across the United States two safe and secure shipping methods for its customers – via Federal Express, fully insured through Lloyds of London and now via Brinks Global Services. Brinks pioneered secured trade show transportation and storage for the diamond and jewelry industries. Brinks is the name trusted by fine jewelers and diamond dealers around the world. The Brinks Armed Courier service is available with next-day pick up and overnight delivery. Pick up may be scheduled from any business location and Internet Pawn will coordinate all the details of pick-up. After requesting a pick up, an armed Brinks guard will pick up a customer’s package and enclose it in a Brinks delivery bag, which is kept under armed guard until it is delivered to our secure processing center in Denver. Launched in 2009 by 25-year industry veterans most recently responsible for the Jumping Jack Cash chain of traditional pawn shops in Colorado and Utah, Internet Pawn is the first Web-based pawn shop in the United States. As such, it is revolutionizing a 3,000-year-old industry by guaranteeing secure, confidential, asset-based loans with consumer-friendly rates and terms online. Internet Pawn offers loans based on the collateral of customers’ personal valuables providing cash quickly with no payments for six months. A member of the Better Business Bureau and National Pawnbrokers Association, Internet Pawn guarantees a premium value based on its experience and proprietary valuation technology, and all transactions are conducted from the privacy of the customer’s home. For more information, go to https://pawngo.com/.